Dr. Andres Figueroa graduated with a B.S. in Mathematics from the Universidad Autonoma del Estado de Morelos, Mexico, in 1998. He was then offered a fellowship to pursue graduate studies at the University of California Riverside, where he obtained his Doctorate degree in 2004 from the Computer Science Department. 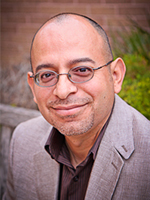 Dr. Figueroa is an Associate Professor in the Computer Science Department at the University of Texas Rio Grande Valley. He joined the faculty in 2004. His current research interest includes algorithms, theory of computation, bioinformatics and computational molecular biology. More recently, his work has focused on statistical genetics, genetic epidemiologic studies, family and case-control studies using haplotype blocks, and identification of multiple genetic markers influencing heritable traits.